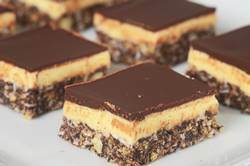 Nanaimo Bars are one of Canada's favorite confections. The beautiful City of Nanaimo, British Columbia has claimed them as their own. The story goes that a Nanaimo housewife entered a recipe for a chocolate square in a magazine contest. She called her recipe 'Nanaimo Bars'. She won the contest, and her "Nanaimo Bars" eventually became popular throughout Canada, as did the town they were named after. These no-bake, three layered bars are famous for a reason, they are delicious. They start with a Graham Cracker Crumb base, followed by a layer of custard buttercream, and the crowning glory is a smooth and glossy layer of dark chocolate. There are many different recipes for these squares. In fact, when the City of Nanaimo ran a contest back in 1986 to find the 'ultimate' Nanaimo Bar, there were about 100 recipes submitted. All Nanaimo Bars begin with a base layer, a wonderful combination of unsweetened cocoa powder (regular or Dutch-processed), chopped nuts (walnuts or pecans), dried coconut (sweetened or unsweetened) and graham cracker crumbs (or crushed Digestive Biscuits). Once this mixture is pressed into a pan and chilled, it is then covered with a rich layer of buttercream made with butter, powdered sugar, custard powder, and a little milk (cream). An important part of this buttercream is the dried custard powder, which was the invention of an Englishman, named Alfred Bird. He invented this powder because his wife loved homemade custard but was allergic to eggs. Alan Davidson in his "The Oxford Companion to Food" tells us that this powder is not, in fact, a dried form of real custard but is just cornstarch and sugar that has been colored and flavored. When the dried custard powder is used in this buttercream it adds a nice flavor and color. Now, if you live in the States, custard powder can be hard to find. I have found it in some grocery stores, specialty food stores (Bird's Custard Powder is the most popular brand) or online, but if you are unable to find it, just substitute it with an equal amount of instant vanilla pudding, or you can simply leave it out. The finishing touch to these squares is a coating of shiny semisweet or bittersweet chocolate that provides a slight crunch as you bite into them. For this recipe, because chocolate is one of the more dominant flavors, make sure to use a good quality chocolate that you enjoy eating out-of-hand. When choosing a chocolate, always look for one that has a lovely shiny finish (a sign that the chocolate was cooked at the right temperature for the right amount of time) and one that has that wonderful 'snap' when you break it into pieces. Nanaimo Bars: Line the bottom and sides of a 9 inch (23 cm) square pan with foil. Bottom Layer: In a saucepan over medium low heat, melt the butter. Remove from heat and whisk, or stir, in the sugar and cocoa powder and then gradually whisk in the beaten egg. Return the saucepan to low heat and cook, stirring constantly, until the mixture thickens (1 - 2 minutes). Remove from heat and stir in the vanilla extract, graham cracker crumbs, coconut, and chopped nuts. Press the mixture evenly onto the bottom of the prepared pan. Cover with plastic wrap and refrigerate until firm (about one hour). Middle Layer: In your electric stand mixer, fitted with the paddle attachment (or with a hand mixer), beat the butter until smooth and creamy. Add the remaining ingredients and beat until the mixture is smooth. If the mixture is too thick to spread, add a little more milk. Spread the filling evenly over the bottom layer, cover, and refrigerate until firm (about 30 minutes). Top Layer: Chop the chocolate into small pieces. Then, in a heatproof bowl, over a saucepan of simmering water, melt the chocolate and butter. Spread the melted chocolate evenly over the filling and refrigerate for about 10 minutes or just until the chocolate has set. Using a sharp knife, cut into squares. Yield: Makes about 25 squares. Preparation time 45 minutes.